Something you really need to pay attention in your drivers education classes is vehicle theft. It’s not something pleasant to think about, but one of the most frustrating things that can happen is car break-ins. One of the most common forms of larceny in the US are thieves stealing valuable items in vehicles, leaving you with costly repairs and figuring how to replace your stolen items. 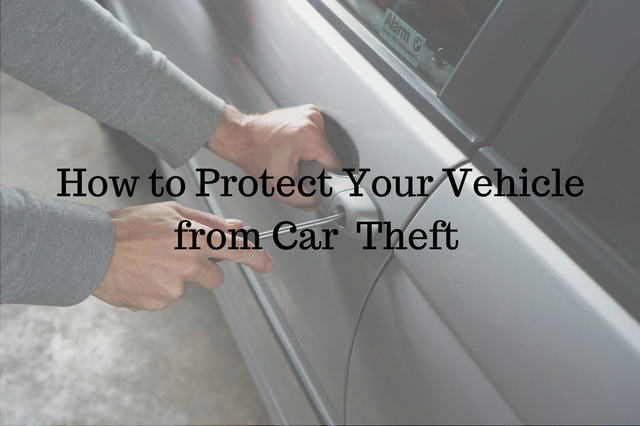 While there’s no way to completely protect your car from theft, there are some simple and easy steps to help prevent it. The overall goal is to make your car seem like it’s not worth checking out so the thief will move onto another one. Most car thieves aren’t looking to do a whole lot of work, which means that they’re looking maximum gain for the least amount of work. in other words, they’re probably looking for cheap thrills and little extra cash quickly and easily. The simple solution is to make more work for them to break into your car. Start by making sure you lock your doors and all windows are closed. Yes, pretty common sense but many people tend to forget when they’re in a rush. If you have a security system, make sure you activate that when you leave your car. Another thing to consider is to keep your valuables out of plain sight. That means locking items in your trunk. Putting items in your glove compartment is not a good idea as it’s a pretty obvious place for thieves to look for items. It’s also important to not leave visual clues for potential thieves. That means stowing away cables and cords or even something as simple as a shopping bag or cases in plain sight. If permitted by local laws (and if you personally like the look of them), you might want to consider tinting your windows so it’s harder for thieves to look inside your car unless they walk right up to it. Thieves don’t like any chances of anyone seeing them, so the last thing they would want to do is try to steal in crowds. Keep your car parked in a visible and safe location, particularly ones that are in high traffic areas. Even better if it’s a busy parking lot with lots of people walking around. Something else to consider is to park in well lit areas. If you can choose a lot with attendants or at least visible security cameras close by so thieves know they will be watched. Never leave your keys in the car. Sure, you may be just making a brief stop, but thieves are on the lookout for easy wins, and running cars are definitely one of them. Many of them are on the lookout for these sorts of vehicles at ATMs, convenience stores and gas stations. If you live in areas where it’s very cold in the winter, it’s tempting to let your vehicle warm up. If you do that, never leave your car unattended. That being said, don’t ever hide a second set of keys anywhere in your car. You may think you’ve hidden it in a good spot, but to thieves, it may be an obvious place and your car (and its valuables) will be gone before you know it. Brushing up on your drivers education should include making sure that you’re preventing your car from being stolen. Take all of the above common sense and simple tips and be sure to use them. Your car and wallet will thank you.